High quality reproduction in the style of the Wish Chair CW24 . Was a leading Danish designer of daring originality. Among his most important creations is the CW24 Wish Chair, designed in 1950 in the Scandinavian tradition of organic design and quality. Its Y-shaped and its curved shape is very ergonomic for your back. 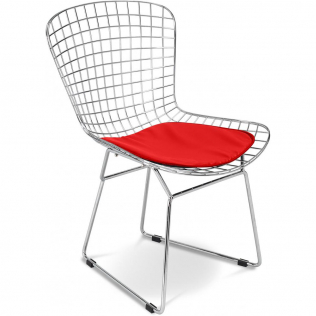 The CW24 Wish Chair can be used as a dining chair, in an office or as an extra seat in a living room. This chair, also known as the Danish Chair or the Chair, will ensure optimal comfort and draw the attention of your guests with its originality. This modern design chair will enhance any room of your home with a contemporary touch. This dinin room chair fits just as well in a kitchen, living room or office, in fact wherever you want! The natural colour of this dining room chair adds a touch of sobriety to its pared-down style. Today, does it again with this Wish desing chair CW24 - Natural Seat.We are helping to bring you design products that cannot be found elsewhere at cost prices directly from factories in Asia. Our team is always on the lookout for unique, top quality products and we are stepping up our efforts to bring you choice and quality at cost prices, products that will charm you with their design, their originality and their price!